of his last seven starts, with two 1-0 shutouts. Earning bucks by stopping pucks as an NHL goaltender is a hard enough way to earn a living. Doing it as a backup goalie in the League is even tougher – just ask Florida's Craig Anderson. "I learned how to be a backup when I was with the Blackhawks," the Panthers' netminder explained. "I can tell you from experience that it is something that's learned. It's definitely not something that's automatic. It's something that you have to grow into. Some guys are quicker (learners) than others." While every NHL goaltender needs lightning- quick reflexes, a very short memory and a strong set of shoulders on which they will be asked to carry their team on some nights, the backups need a little extra in their goalie bag of tricks to remain successful and employed in the NHL. These forgotten men on NHL rosters sit at the end of their team's bench most games, waiting patiently for their opportunity to contribute. Even though they don't play in games on a consistent basis, these puck-stoppers must be ready for action at a moment's notice. They must be prepared to give the team's franchise goalie a night off every once in a while in order to keep him fresh, while also being able to perform at a high level when asked to go in cold off the bench. Anderson got his feet wet as an NHL backup during the 2002-03 and 2003-04 seasons, when he appeared in 27 games for Chicago. But the former third-round draft pick (73rd overall) of the 2001 NHL Entry Draft really didn't get comfortable as a backup in the League until the 2005-06 season, when he played behind former Stanley Cup-winning goaltender Nikolai Khabibulin. "A few years ago when I was with the Blackhawks, I was 21-22 (years old) and we had a sub-par team when I got there,” Anderson said. “We were way out of the playoff race, so it was a learning experience. Chicago had gotten rid of all their star players and were rebuilding, so I just got thrown into the fire. They expected me to play well and it was quite a big jump. The support really wasn't there on the ice, so I had to deal with that. It wasn't until I backed up Khabibulin after the lockout year that I really learned how to be a backup. It took me about at least half the season there before I started realizing what you had to do to get yourself ready." During that season, Anderson played 29 games for the Blackhawks – starting 21 – recording a 6-12-4 record with a 3.32 goals-against average, .886 save percentage and one shutout. 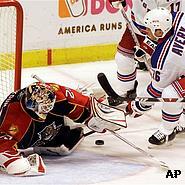 Anderson was traded by Chicago to Florida on July 25, 2006 in exchange for a sixth-round draft pick in the 2008 NHL Entry Draft. He didn't see much action during his first year with the Panthers, as he was third on the depth chart behind Ed Belfour and Alex Auld. Anderson spent most of the 2006-07 season in the minors, appearing in 34 games for the AHL's Rochester Americans, where he posted a 23-10-1 record with a 2.56 GAA and .919 save percentage. Late last February, Anderson got a chance to show the Panthers what he could do when Auld went down with a left knee injury, causing him to miss the final 22 games of the regular season. While Anderson only played in five games, starting three – going 1-1-1 with a 2.21 goals-against average and .939 save percentage – he showed Jacques Martin enough that the Panthers' GM/head coach re-signed him to a two-year deal in the offseason. "Craig played very well in his backup role for our club during the later part of last season and we felt that he was most deserving of an NHL contract," Martin said. "He is a diligent, focused and high-character player who works hard to stay prepared night in and night out. "Craig fit our backup role perfectly. He proved in Rochester that he can play at the next level and he played well in some key games for us down the stretch last season." "When I came up last year after Alex Auld got hurt and backed up Eddie Belfour, I was ready because of previous experiences with the Blackhawks," Anderson said. "I think I sat 17 straight games before I got a game. I made sure that I took my learning experiences from Chicago on how to prepare myself in practice, so that when I did get my opportunity to play in a game that I was ready to give the team a chance to win. Those experiences were definitely the stepping-stones to where I am now and what I've learned." Recently, Anderson has been one of the main reasons the Panthers remain in the hunt for an Eastern Conference playoff berth, winning six of his last seven starts. Included in those six wins is a pair of 1-0 shutouts he recorded on back-to-back nights against the Islanders and Bruins to open March. It marked the first time in Panthers history the team had blanked its opponents 1-0 in consecutive games. As a matter of fact, the last time Florida recorded back-to-back shutouts of any kind was Oct. 5 and Oct. 7, 2005. Anderson played a third straight game, beating Pittsburgh, 5-2, and the Panthers haven't lost since. Anderson has proven just how invaluable a solid backup is to an NHL team – especially one that is fighting to make the postseason. Panthers are on a long win streak. Who's hot – Florida's Tomas Vokoun posted a 3-0-0 record last week with a 1.67 GAA and .946 save percentage, helping the Panthers extend their winning streak to a franchise-record-tying seven games. 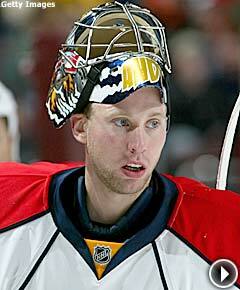 Vokoun leads all NHL goaltenders in shots faced (2,031) and saves (1,862). … Tampa Bay forward Jeff Halpern is riding a five-game point streak, during which he's posted eight points on four goals and four assists. … Atlanta's Slava Kozlov has recorded four points in his last four games, including a goal and an assist Wednesday night in a 5-3 loss to the Hurricanes. … Carolina forward Sergei Samsonov has notched 11 points for the Hurricanes in the last eight games, including a three-point effort in a 5-1 win over the Lightning last week. … Washington center Brooks Laich has points in six of his last nine games, including a career-high three straight. Laich didn't have a two-goal game in his first 214 career games, but has scored twice in three of his last 12 games. Laich has 10 goals and 14 points in his last 15 games, and has more than doubled his career high with 19 goals. Southeast Quotes – "I think that's what you play for, and I think you have to always remember that you play 82 games in the regular season to get in the playoffs because that's where the most fun. … You play to have a chance to win a Cup, and that's only if you get into the playoffs." – Florida's Tomas Vokoun, on his team being in position to qualify for the Stanley Cup Playoffs. "The most important thing for me is not beating some records. Right now it is all about winning games and all about getting two points." – Washington's Alex Ovechkin, on Tuesday night after becoming the first Capitals player to record 100 points in a season twice. A look ahead – On Friday, the Washington Capitals travel to Atlanta. On Saturday, the Tampa Bay Lightning visit the Florida Panthers. On Tuesday, the Capitals are in Carolina and the Panthers take on the Lightning in Tampa Bay.